I planted one single little teensy weensy “Million Bells” and now have a whole lot of them getting ready to be picked. Alas, I will be on a much-anticipated road trip with Mr. 761 when they ripen completely…. argh. We all know I’m not a gardener. Not at all. However, I like that time in the spring (pre earwig and other buggies, pre-0vergrown weeds) when I can dream about it all. It was at that time that I planted this little guy up against my picket fence, amongst the sweet peas and lavender. Oh how I wish these bells would have tinkled before I had to go away for 10 days! What are the odds that there’ll be some left when I get home? And I mean edible ones… not the ones that will have rotted on the vine while I was away, gaily rummage sale-ing my way through parts of New England and upstate New York. 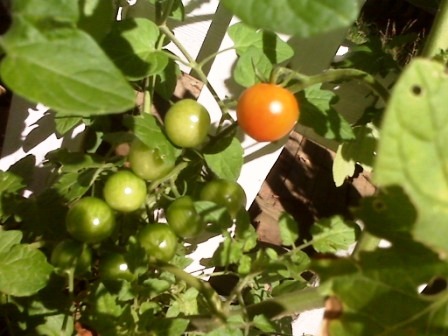 When I am happily visiting with my mother-in-law in Ontario, will these tomatoes be taking their sweet time to ripen sweetly, so I can have them when I get home? Nature, alas, waits for no woman. I will therefore, charge a friend with eating as many off the vine as they can, while I’m gone. I want to know that someone will enjoy them. I’m just not planning effectively! Last time I went down to GA to visit my folks, all of my roses bloomed at once, and were distinctly not fresh when I got back. I’m not sure how much posting I’ll be doing while away, but I’ll be taking photos and making notes so I’ll have stories to tell when I get back. IF there are tomatoes left when I get back, I have some great recipes for them and will share. If there are no tomatoes, I’ll just sulk, I think.